Things mostly went very well, and we've released Debian 9 this weekend past. Many many people worked together to make this possible, and I'd like to extend my own thanks to all of them. As a project, we decided to dedicate Stretch to our late founder Ian Murdock. He did much of the early work to get Debian going, and inspired many more to help him. I had the good fortune to meet up with Ian years ago at a meetup attached to a Usenix conference, and I remember clearly he was a genuinely nice guy with good ideas. We'll miss him. For my part in the release process, again I was responsible for producing our official installation and live images. Release day itself went OK, but as is typical the process ran late into Saturday night / early Sunday morning. We made and tested lots of different images, although numbers were down from previous releases as we've stopped making the full CD sets now. Sunday was the day for the release party in Cambridge. 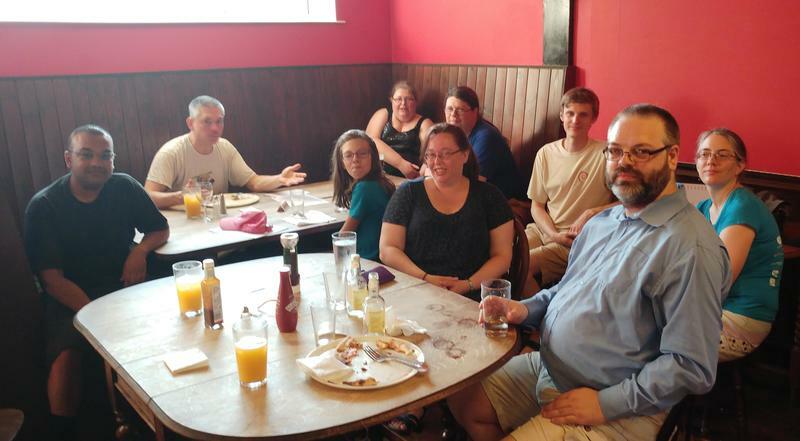 As is traditional, a group of us met up at a local hostelry for some revelry! We hid inside the pub to escape from the ridiculouly hot weather we're having at the moment. Most undercover Debian Stable release. Ever. Seriously, the cacophony of silence from the Linux-aware community is strangely eerie. Make no mistake, this was a huge undertaking, undertook by a lot of very talented people that pulled off a ridiculously successful threading of a LOT of downstream needles. What happens in Debian influences all of Linux, and thereby the entirety of the world both on and off the internet. We don't read news stories about when schools full of children drink everyday from fountains dispensing pure water activated with only a button, or when thousands of people are able to safely gather at one place in the dead of night because its lit by electrically powered illumination. We don't read about these miracles despite the fact that their occurrences are literally unprecedented in 99% of human existence. We only read about it when it doesn't happen. Perhaps, to no doubt a much smaller degree, that is where Debian is now. Perhaps the greatest testament to the Debian team is how little everyone is talking about the latest successful release of Debian Stable. Great job folks. In your own way, you've steered the world more than most. This user is in your debt.